ISH shares their Layers of Love! The artists in K1 never seize to amaze me! Each of the artist's home, which they made using scratch art technique is unique just like their character. We started off the session by remembering who our characters are. We dove deeper into our stories and lives of our characters and talked about what their homes were like. What does the outside of their home look like? What about the inside? We used our own homes as reference. K: The Ninjagos are playing outside in their yard on a sunny day. DEV: Spiderman is dressing up in his house to get ready to fight the bad guys. V: Elsa is coming inside her house to have snacks. SH: Elsa is playing outside in the park, but all of a sudden it rains so she ran inside her house. DEE: Elsa went outside and saw a swing and then she went on it. She saw a bean stalk and climbed up it and saw a castle and a giant. G: Elsa is looking out the window and she saw somebody. She ran outside and played with them. K: Elsa coming home from the market. AI: Elsa lives in a home. She's looking at the Caste's garden. SA: It's quiet inside the home. MI: He lives in a den. He is hiding from the fire outside. He is safe inside. EN: Living on the rocket, they are flying far away with the rocket. They are eating food inside. SP: There is a tornado with spaghetti and meatballs in it. SH: It is a car park with some tractors. KA: Ninjago and doodle are making spaghetti. AL: Piccachu is playing football outside the house. SAT: The boy is playing with his toys inside the house. As you can see everybody was open to exploring how we can use this technique to understand spaces and the revealing process of the different layers involved in life and in art practice. We hope our friends in Mexico like it! The 4-5 year olds in K1 at International School of Helsinki in Helsinki, Finland are making and sharing art with the 4-5 year olds in K2B class from San Patricio Colegio in Monterrey, Mexico. The Tigers know how to love! The Tigers really amaze me with how present and creative they are! As if we were in the homes of our characters we were drawing the interior and exterior of their houses. Brilliant! Each one is unique and takes you to a special place. Everybody was eager to draw with oil pastels and paint. At first the scratching came as a bit of a surprise, but once they realized the affect it would give, they experimented away! We hope our friends in Mexico enjoy our artwork and stories! 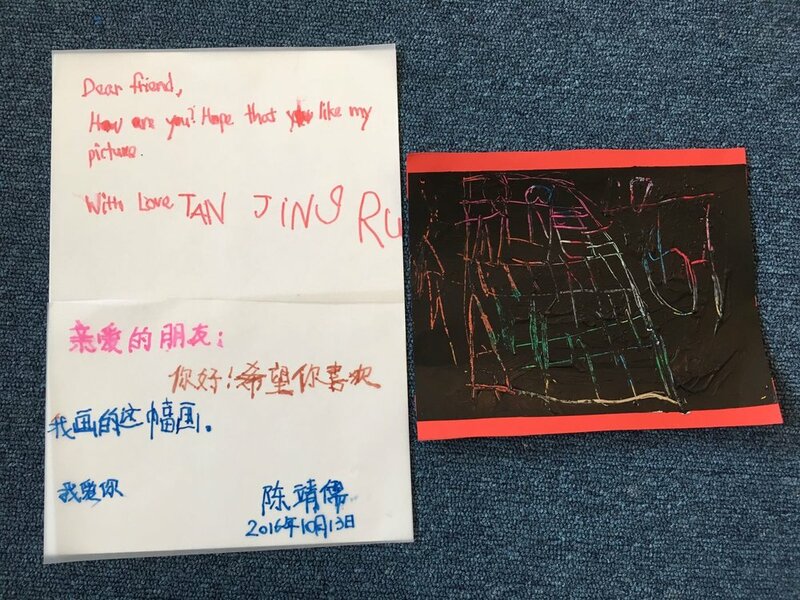 The Tigers from Your School in Espoo, Finland are making and sharing art with Nursery A from Colegio San Patricio Cumbres in Monterrey, Mexico. Both groups of artists are 4 years old. The story gets even more exciting with the Monkeys! We started off the session by telling each other stories about our characters, which we had made from the previous Dear You art workshop in Lights, Camera, Action!. From then on, it was a smooth flow as to how to develop our ideas when creating our homes for the characters in Layers of Love. We took each other on an imaginary adventure to discover what's on the inside and on the outside of our home. As we scratching away the top layer the Monkeys realized that they could manipulate what they would like to reveal about the inside of the house. Can you see which picture matches the artist's description? K: I have an apple tree and pear tree and strawberries in my yard. E: I have many strawberries in my backyard. There is a forest nearby. VIO: My house is white. There is a forest and there are blueberries in the forest. O: My house is brown and there are some trees around it. VIG: It has many door and many flies. N: My house is black. My room is so big. L: It's white and super large. J: It's long and it has a big room. VE: It's white and big and beautiful! A: It's white and almost big. P: My house is big and the door is brown. The floor is brown because it's made of wood. I: My house is a rainbow from the outside. AA: I have a forest, terrace, trampoline, and black door in my house. AL: I have a green house with a dark brown roof. E: My house is red and black. There are trees around it. 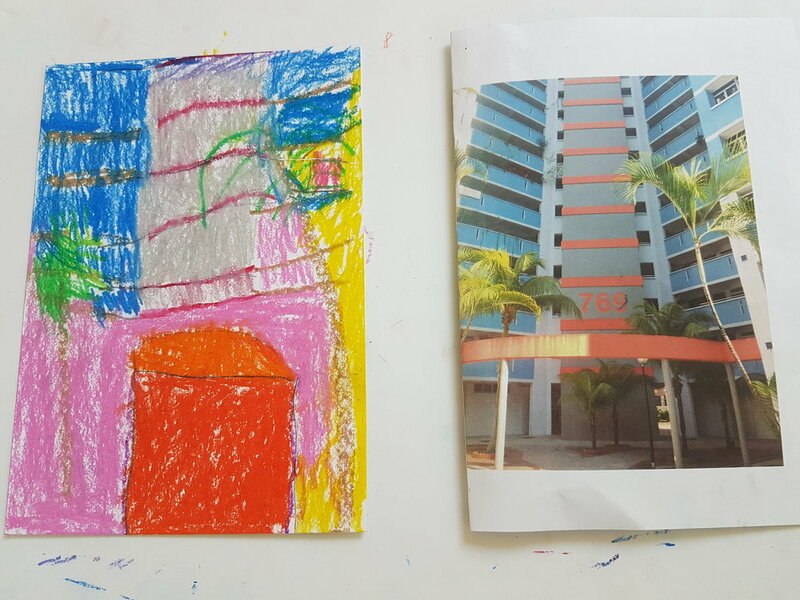 The 5-6 year old Monkeys from Your School in Espoo, Finland are making and sharing art with the 5-6 year olds from Colegio Bosques de las Cumbres in Monterrey, Mexico. The artistic boys at Espoon kuvataidekoulu (Espoo's Visual Arts School) had fun creating the inside and outside of their character's home using scratch art technique. When everybody came into the studio, on the tables were their characters they had sculpted out of clay and then painted. They were so happily surprised to see how their figures changed when fired in the oven! These were the characters they invented for the first project, Lights, Camera, Action! and have been continued into the following project, Layers of Love. After some discussion about their characters we moved on to where they live. Everybody had a unique response. We first created what their home looks like on the inside. The colors they chose also help convey the feeling of the place. The artists were a bit wary of painting over the oil pastel drawings, but once they understood how scratch art technique worked, they got very involved with drawing the outside of their home. Each one is unique and tells their own story! We hope our friends in Mexico like these artworks! The Toddlers at Oakdale Montessori followed with the lights, camera, action theme. We asked the Toddlers to colour in 2 shapes ad Triangle and a Square with this project. As the theme was about inside of a house. We decided to make houses and decorate the outsides. The Toddlers coloured in with wax crayons and the painted the square for the house and the triangle for the roof. As the Toddlers are so small we did as staff help them with the windows and the smoke. The Early Childhood class gathered together during Circle time and spoke to them about how we received Elma the Elephant and this time we will be sending back art in a shape. The children chose a square to work with. I think that fun was had by all watching the colours come up through the paint work. The Toddler and Pre-school groups from Oakdale Montessori Preschool in Cape Town, South Africa are making and sharing art with Nursery C and Kinder C classes from Colegio San Patricio in Monterrey, Mexico. The artists in Mexico inspire creativity for their friends in South Africa! 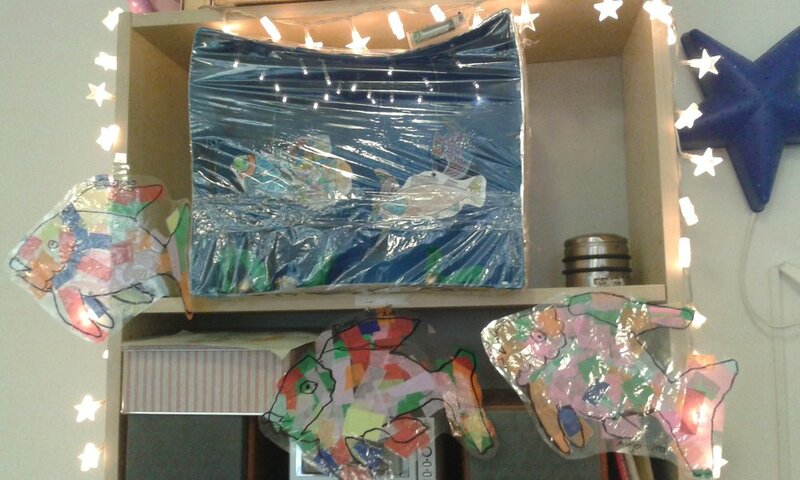 The 3-4 year old artists at Oakdale Montessori Preschool in Cape Town, South Africa are making and sharing art with the 4 year old artists at San Patricio Colegio in Monterrey, Mexico.